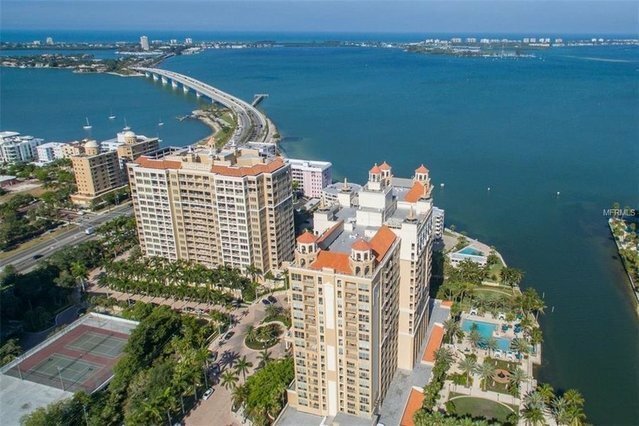 Enjoy all that the Florida luxury lifestyle has to offer in this newly renovated three bedroom, three bath condo in The Tower Residences at The Ritz-Carlton. Upon entering the building, you will be greeted by the concierge and welcomed to your personal paradise. Take the elevator to the 8th floor and exit into your private foyer. As you enter, you will notice the light and bright interior with views of downtown Sarasota, the Sarasota Bay and marina. This unit boasts current design trends with gray and white harmonizing in the 39-inch porcelain tile throughout, quartz and granite counters and modern cabinetry. Kitchen features Sub-Zero refrigerator and brand new GE Monogram appliances. Plumbing fixtures are updated and are of luxury standards. Two assigned parking spaces in the secure garage are included.Tower Residences have superior amenities including 24-hour in-residence dining service, daily continental breakfast, heated pool and spa, grill area, theatre, fitness center, social and club rooms, sauna, steam bath, and massage therapy room. You will be recognized with VIP status at all Ritz hotels and membership is available for The Ritz-Carlton Beach Club on Lido Key and the Ritz-Carlton Golf Club in Lakewood Ranch. The Tower Residences are conveniently located in close proximity to downtown Sarasota and St Armands Circle with many dining and shopping options as well as several cultural venues and less than three miles to sugar sand Gulf beaches.